Ok, I'm cheating a little bit because this room is from yesterday's post and I held on to it for today because it's SO GOOD. I thought it needed it's own post. THAT RUG. The chair trim. The grasscloth. It's like a mullet room - business on the top, party on the bottom. I'm just so in love...if that rug wasn't there, we can all agree this room would be lovely and vanilla. But that rug just makes it - I'm all for a fantastic juxtaposition. Go forth and juxtapose. Have a great weekend and see you next week! 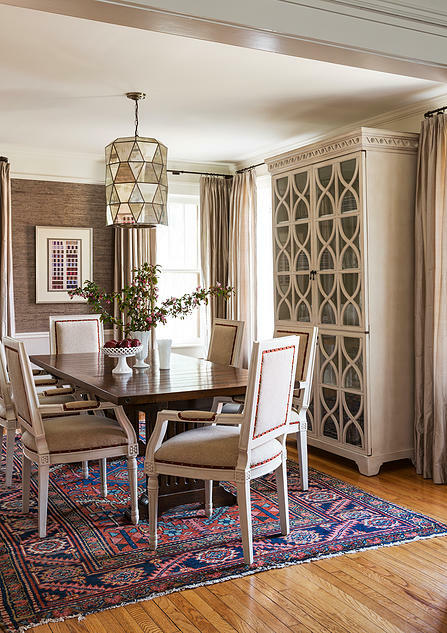 Oh yes, the rug and the design on the china cabinet is gorgeous!